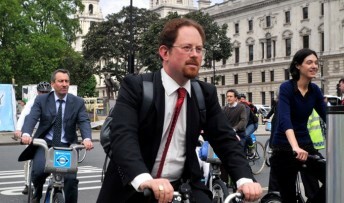 A family run business selling new and vintage bicycles has taken the monthly title in MP Julian Huppert’s Discovering Cambridge competition. Kingsway Cycles in City Road wins the Sports and Outdoor Activities category for April in the competition which celebrates Cambridge’s independent businesses. The company was established in 1978 and is run by a father and son team who carry out repairs and servicing, as A family run business selling new and vintage bicycles has taken the monthly title in MP well as being able to source hard to find specialist items. Kingsway Cycles offers bikes for hire and has an online shop – Cambridge Cyclemania..
Julian said: “I am really pleased that Kingsway Cycles have won this month’s competition. One nomination for Kingsway Cycles praised the business for being “unfailingly helpful” and for providing a “high quality service for bike repairs at a reasonable price”. This month Julian is asking for nominations for the best independent clothing or accessories shop. The category includes shops selling shoes, jewellery, men or women’s clothing, university outfitters, vintage and second-hand clothes etc.